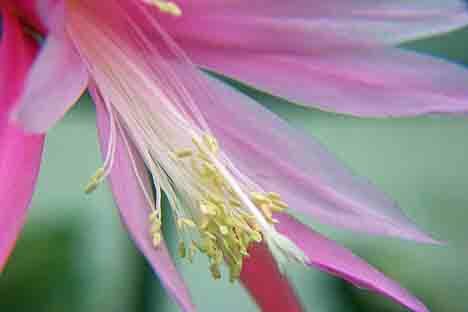 I haven't had time to get out in the greenhouses with the camera. We're having another cold spell and - of course - one of the heaters is acting up - again! 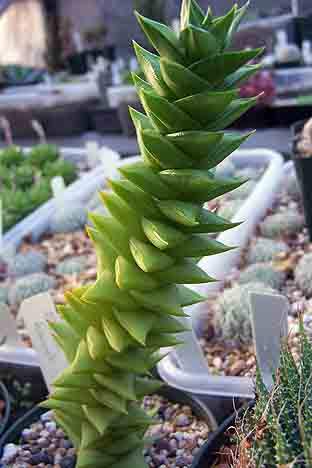 So, from the archives, comes this photo of one of my favorites, Haworthia truncata var. maughanii. 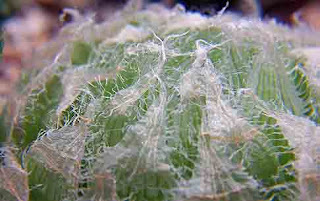 This is from seed and it's just a fascinating plant. Since I probably won't have time to blog tomorrow (it's New Year's Eve, the day after our grandson's birthday and the day before mine), I'll wish you all a wonderful New Year! I've been too busy to take pictures lately so...I guess it's time for some re-runs. So, here goes! Sedum rubrotinctum 'Aurora' is a plant that I don't think gets enough attention as a decorative holiday accent. 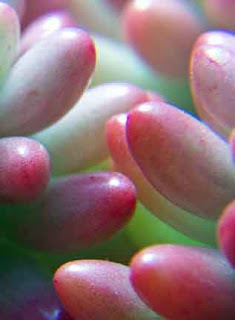 The common name, "Pink Jelly Beans", doesn't do them justice. They're an outstanding, easy to grow plant, which can be used effectively in a small dish garden on a windowsill, or as a temporary table centerpiece. They're a plant which seems to invite you to have some fun with them, arranging them with other small yellow or green succulents to great effect. 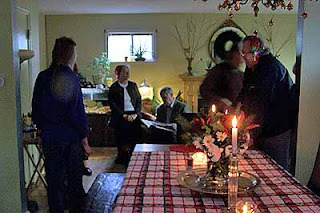 If this has been a holiday time wherever and whoever you are, I hope it was a good one, with an emphasis on the universal hope for peace, hope, joy and love. Best wishes to all of you out there. I appreciate your checking out my blog once and a while. Thanks. I haven't had time to post for the last few days. The old oil heater we use in one of our greenhouses has a mind of its own, and it's decided to go on strike. As a result I've been wrestling copper fittings and flare fittings and cleaning out old equipment (soot everywhere). This is one of those miserable tasks which sometimes goes along with growing plants, especially if you can't afford to hire someone to do it. Besides, this stuff is so old, I doubt any repair people would have a clue about what to do. I have to re-do some fittings in the a.m. and then pray that the float valve works. If it doesn't, we'll have to order a new one. And then maybe I'll have some time to post some pictures before Christmas. 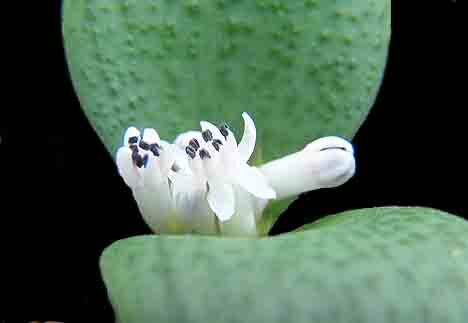 Massonia jasminiflora: These are winter flowering plants from the eastern Cape Province in South Africa. 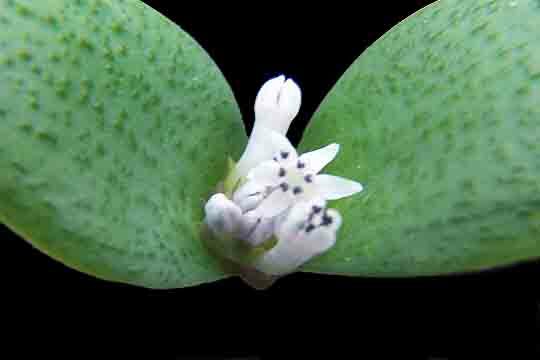 A great little succulent bulb with two leaves which can be quite variable, and - as the name hints - the flowers have the distinct aroma of Jasmine. Our biggest problem is finding a way to maneuver down the aisles to get over to where these plants are! 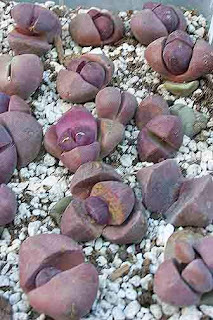 Looking very much like a science fiction plant from outer space, Adromischus marianae 'Herrei' is highly variable in color and texture. It's worth collecting more than one clone. 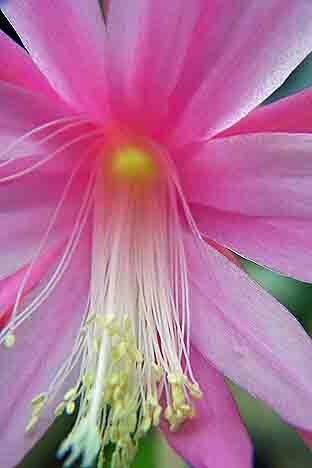 We can never keep enough of these around, but we always keep some back for propagation and personal enjoyment. Tonight just some random shots from the Christmas Party of the Oregon Cactus & Succulent Society. We're small, but we had 20 at the gathering and I think everyone had a great time. A special thanks to Laura for hosting us. 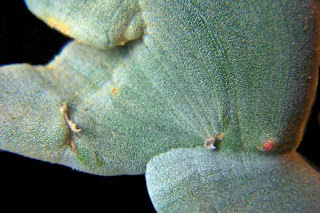 This is a plant we've had for a long time, a crest of Pedilanthus macrocarpus. We're going to be putting this up on Ebay soon, along with the two Haworthias we just posted. It obviously has a normal offshoot which will need to be removed, but we'll leave that to the buyer. Commonly known as the Slipper Plant or Candelilla, it is native to the Sonoran Desert of Baja California and Sonora, Mexico. The crested form is highly prized and sometimes occurs naturally in the wild. Actually, candelilla (meaning "little candle") is used for at least two plants in the spurge or euphorbia family (Euphorbiaceae). 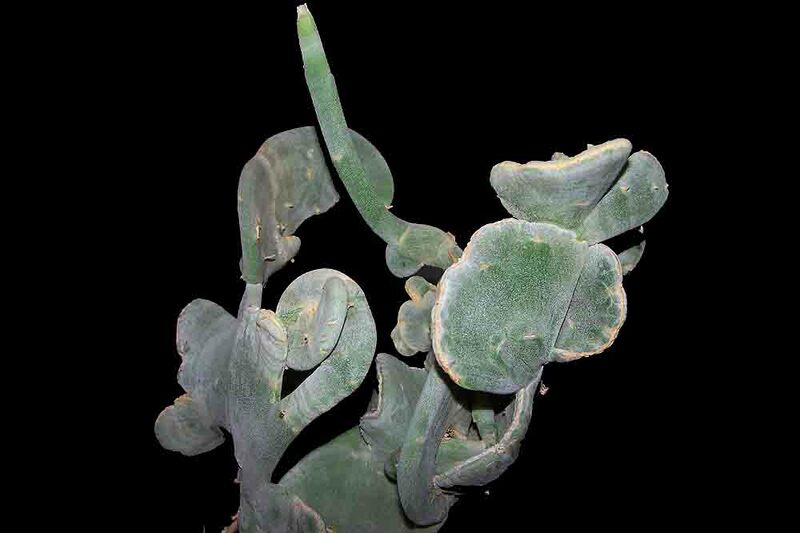 The other plant is Euphorbia antisyphilitica of the Chihuahuan Desert. This is one of those plants which has been bounced around a bit: Aloe, Haworthia, Astroloba, Astroworthia ... and the list goes on. 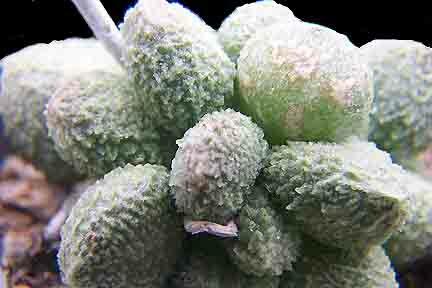 I'll stay with the later and call it x Astroworthia bicarinata. Whatever its name eventually turns out to be, it can be quite impressive in its own right. 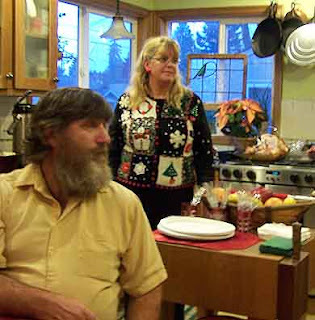 For those in the Portland, Oregon area, the OCSS Christmas Potluck and Party will be this coming Sunday, December 12 at 2:00 pm. Please call me at 503.913.7123 to RSVP. The club will supply the meat dishes. Also, for those who check back occasionally at our nursery web site for new Haworthias, we posted new updated pages today. At least for a while they'll be up to date! And then, much to our surprise, we looked up from our more mundane chores and there was Epi 'Piland's Pride' putting out it's relatively small but vibrant flowers. 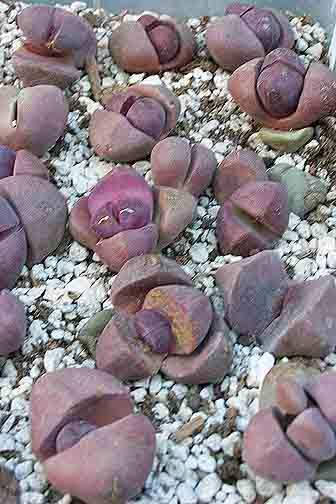 It just goes to show that, in the succulent nursery, there's always something wonderfully unexpected happening. This is Haworthia semiviva, which means the "half alive" Haworthia. I posted a picture of this last year at about the same time of year, but I just couldn't resist. They're looking really nice right now. We don't have any for sale on our web site right now, but maybe pretty soon. A new revision of the Haworthia pages should be up within a week or two. If you're interested, check back soon. 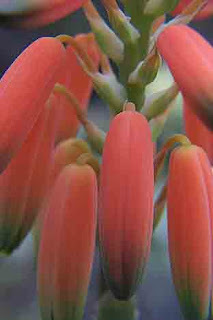 Today we move from white to very bright: Aloe krapohliana var. 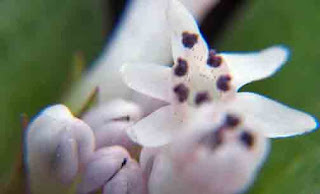 dumoulinii. This aloe is reputed to be a bit touchy with water, though we haven't had any problems raising them. But even if they do prove difficult to some, this flower makes them worth it. 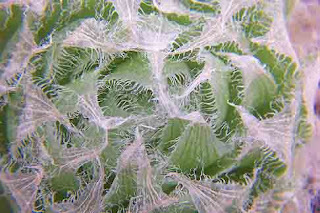 All three of these shots are of the same flower yesterday in greenhouse #2. We've been taking quite a few photos and I'll post some of them pretty soon. But...not tomorrow. 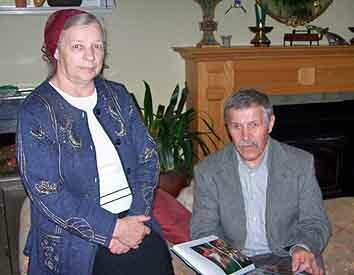 Tomorrow is Lynn-Marie's birthday, so we'll be doing something special. 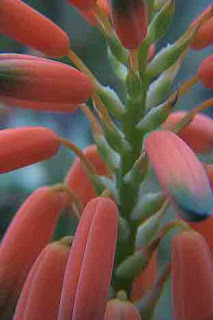 So for tonight, just a quick photo of one of the flowers happening now: Aloe albiflora. Rather humble plants, they get their braggin' rights when the flowers show up. 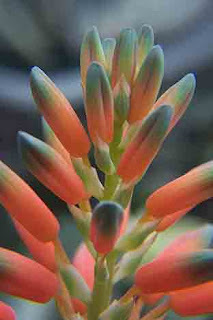 A native of Madagascar, this is a great addition to any succulent collection.